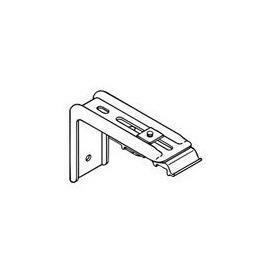 Support bracket for estate ultra 2" decorative traverse rod., by Kirsch -- BasicQ Inc.
Use with estate ultra and Architrac 94001 track systems for wall mount support. Supports should be used every 4 feet minimum. Clearance 1 1/4 to 3 1/4 inch. Returns 3 1/2 to 4 1/2 inch.Size: 2 15/16" x 2 1/4" Priced Each.